Home to one of the world’s busiest airports and some of the most beautiful properties in the southeast, Atlanta’s got something to fit nearly every taste and price range. As Georgia’s capital city, Atlanta is the hub of the southeast and home to dozens of the nation's fortune 500 companies. The real estate market in Metro Atlanta has attracted attention from buyers across the globe, many of them searching for affordable luxury in a thriving metropolitan city. Atlanta's housing market is robust, offering nearly every style of home. From quaint bungalows in historic neighborhoods, to the multi-million dollar luxury estates in the heart of Buckhead; Atlanta literally has it all. Start your Atlanta home search by checking out our active inventory of properties for sale. Want to know what homes are selling for in Atlanta? Visit our market trends page for the latest local real estate statistics; then browse recently sold properties in the city. Also, check out our Atlanta city guide to discover what makes this area such a great place to live. When you’re ready to search Atlanta, Georgia houses for sale, you’ll want to start where all the listings are… on the local MLS. If you're looking for in-town properties to buy, like those within the city of Atlanta, you’ll want to utilize an FMLS powered site such as this one. 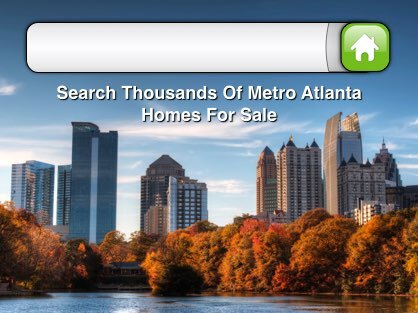 MetroAtlantaHome.com’s advanced search tools allow you to filter results by school district, subdivision, zip code and more. You can even search for homes that have a pool, properties just listed for sale, or draw your own search area on a map to refine your results by location. Once you’ve narrowed down your search to the properties you like, save your custom search by creating an account; then receive daily updates when new matches hit the market. Finding the perfect home has never been easier! When searching homes for sale in Atlanta’s most popular neighborhoods, such as East Atlanta, Midtown, near Emory or in Buckhead, MetroAtlantaHome.com is your #1 resource for real estate listings. 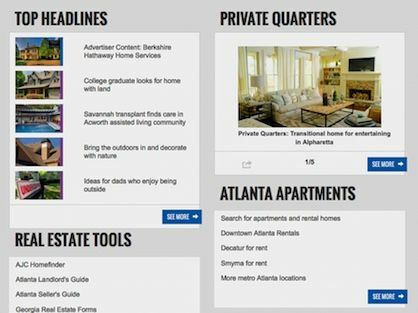 Unlike many of the third party listing syndication websites, MetroAtlantaHome.com only displays up-to-date listings fed directly from the MLS, and does not bombard users with tons of distracting advertising. In addition, this site also provides integrated access to demographics and population statistics, along with nearby amenities for each neighborhood that are accessible directly from the listing results page. Nevertheless, some prefer the functionality and usability of the industry’s largest real estate search portals. Some of the most popular websites for browsing Atlanta realty include: Zillow, Tulia, Realtor.com, Redfin, Movato, Yahoo, and Homes.com. In the Atlanta, GA real estate market, there are plenty of houses listed for sale directly by the homeowner, without the assistance of an agent. 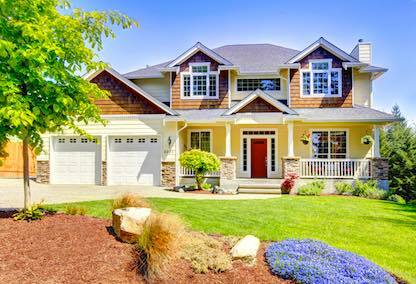 These are commonly known as a FSBO. When searching Atlanta homes for sale by owner, many buyers start online. Although FSBO listings typically aren’t included in the MLS, websites like Craigslist, Zillow, and the Atlanta Journal Constitution's real estate section feature hundreds of these types of listings. Even if you’ve already hired an agent to represent you, many of these FSBO sellers will agree to work with your REALTOR® and offer to pay a commission on the sale. It’s actually quite common for agents and buyers to spot a FSBO sign in a yard while out viewing other properties, so don't rule them out. If you see one that looks promising, have your agent contact the homeowner to see it, which may require a trip back at a later date. The Atlanta real estate market has no shortage of luxury homes. In fact, it’s not uncommon to find mansions for sale in the ten million dollar range, or even more if you’re looking at some of the most exclusive neighborhoods. Despite this, buyers from other major metropolitan areas are often quite surprised at how much home you can get in Atlanta compared to other cities. From private estates set on acres of prime real estate to executive houses in gated golf course communities, there’s something to satisfy the tastes of even the most demanding luxury home buyers. So whether you prefer a spot on West Paces Ferry, Atlanta’s most prestigious street, or a waterfront view overlooking the Chattahoochee river, Atlanta’s luxury property market is sure to satisfy your every desire. With countless brokers claiming to be experts in luxury home sales, how can you ensure you’re working with a REALTOR® who truly knows Atlanta’s high-end property market? This is why Better Homes & Gardens Real Estate created the Distinctive Collection… trusted real estate advisors who understand the specific needs of the luxury lifestyle. Distinctive Collection agents receive specialized training, access to an exceptional marketing program, and exclusive branding designed around the high-end client. 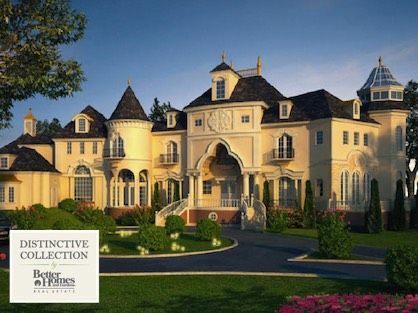 If you’re in the market to purchase or sell a fine home, contact a luxury home consultant today! After a few down years post housing bubble, the Atlanta housing market is thriving once again. The improving economy has enabled the city’s biggest employers to bring back jobs, thus launching new construction back into high gear. While investors are gobbling up the few remaining foreclosures and short sales, developers have resumed old projects & started new ones in many of the city’s best neighborhoods, both ITP and OTP. 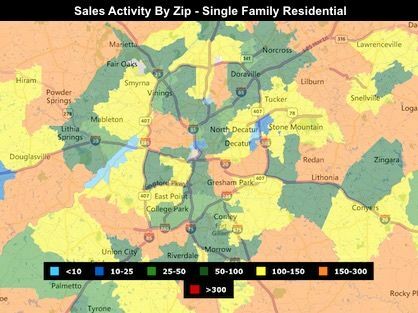 Whether you’re looking for something more traditional, or searching for a completely unique style, Atlanta’s supply of homes is nearly as diverse as its residents. Just starting your property search and unsure where to begin? Try visiting some of the many open houses held every weekend throughout the city to get a taste of what Atlanta’s real estate market has to offer. Currently, the Atlanta, GA real estate market forecast is looking up. Home prices have come back strong from their lows after the housing bubble burst. My Atlanta market trends page features many of the essential housing market statistics that buyers and sellers need to make an informed decision. From price trends to inventory analysis, the auto-updating charts provide years of essential market data, fed directly from the MLS. In addition, I routinely post market updates to my real estate blog, providing my outlook for the future of the local market. It’s my goal to know where property values have been, where they currently are, and where they’re likely going. Keeping up with the Atlanta housing market means following the latest real estate news. With some of the top news outlets like the Atlanta Business Chronicle and Atlanta Journal Constitution releasing real estate related articles daily, there is plenty to read about the local housing market. These great local publications allow you to keep up with the latest housing trends, discover new developments, and see what drives Atlanta’s home prices. Prefer to have the news sent to you? Simply register for a free account on this site and you’ll automatically be signed up to receive my real estate newsletter. At MetroAtlantaHome.com, I blog about many of the trends and topics that impact our local market. My Atlanta real estate blog includes topics such as: buyer articles, seller articles, new listing updates, top local events, reviews of the latest real estate technology and more. You’ll even find videos offering additional insight and information on many of these topics. I’ve also tried to provide outside links to many of the valuable resources I come across while doing my research; all in hopes of helping anyone looking to buy or sell a home in Metro Atlanta. Online access to Atlanta real estate records is available free of charge to the public through the county assessor’s website and the tax commissioner’s website. 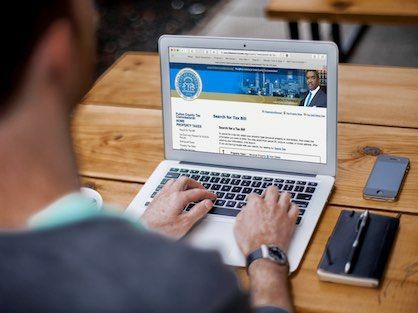 This enables anyone with an internet connection to view property records for parcels located in Fulton County, whether in the city of Atlanta or an unincorporated area. The Fulton County Assessor’s website provides detailed property information such as land, improvement, past sales and parcel information. This is the data used by the county to determine an assessed value for tax purposes. In addition, the tax commissioner’s website provides access to view assessments, tax rates, historical tax records and pay annual tax bills. For those who need copies of legal documents, the Georgia Superior Court Clerks’ Cooperative Authority website is a great alternative to those long trips down to the county courthouse. Once filed by the closing attorney, developer, etc., legal documents are then recorded and uploaded to the site. These documents can then be searched and viewed by registered visitors, then printed for a small fee. Now anyone can look up legal documents such as deeds, liens, plat maps and more from the convenience of home. Creating an account is easy, and access to records extends beyond Fulton County to other counties within the state.